This is something I have heard about for a while. The Japanese (extreme) right wing, called Uyoku (右翼 우익) or Kyoku-U (極右 극우) has a large presence of Zainichi Koreans (Koreans living in Japan). Like the large numbers of Koreans in the ‘Japanese’ Yakuza, the presence of Koreans in the extreme right wing is an open secret and is described in the movie, Kyoki No Sakura (see the trailer here). Koreans seem to be in a state of constant grievance about the existence of these groups, so I was most interested when I found this post by a self described “Japanese rightist” (via Zero). This story is going to be very deep into Japanese underground but significant to unravel Japanese post war culture. Let me get started with my memory almost 10 years ago about Uyoku. When I was a high school student, I often saw cars painted in black like the pic below with a noizy old martial song. Being so noizy and scary, that the cars are far from appealing, making me very disgusted. I happened to found their flyers posted on electric palls after they are away, and look how ugly the posters are! And I got to think that those people, who want old Imperial Japan back, would put Japan’s future in huge jeopardy. Then let me tell you the identity of those people. Many of them are not Japanese, but Korean (zainichi). When I heard about this, I could hardly believe it. Why would they have to disguise themselves as Japanese rightists (Uyoku)? *Recently, the abductions by North Korea is one of the biggest political interests. When the families of the victims are making speech in the station plaza, the cars appear out of nowhere, and strange people gather to collect donation. Of course, the families of the victims never invited them. *Look at the pic of the black car above. You could see the flags of Korea and Japan below the chrysanthemum, which is the symbol of Imperial family. Why would they have to paint Korean flag next to Japan’s? If you can read Japanese, you’d notice the letters saying “Korean-Japanese friendship”. I feel again very unnatural about this because “Japan-Korean friendship” is the right order without exception unless those letters are written by Korean sided people. You don’t know how to read Kanji? No problem. Usually the family names — coming first followed by the given name — consist of two or three characters. Korean’s family names, on the other hand, require only one character to express. If I pronounce those family names, “Soh”, “Lee”, “Shin”, “Lee”, and “Kim”. Those are obviously Korean names without exception. By the way, do you know what typical Japanese names are like? I bet you already know it: “Honda”, “Toyota”, “Suzuki” and so on. It’s always sticking to a rule: consonant-vowel-consonant-vowel-… It’s something to remember if you are majoring in something related to Japanese. Let me get back to the point. The point is that those Uyoku groups have quite high chance that they partly consist of Korean people. Since those Korean people can speak Japanese and born in Japan, I’ll call them “zainichi”, meaning “staying in Japan”. Obviously not all the Uyoku groups are Zainichi, but Koreans are less than 1% of the population and with Korean leaders of at least 5 out of 25 extreme right wing groups, that makes about 20% of the leadership Korean, if the sources quoted by that blogger is correct. If Koreans are as represented in the rank and file of the Uyoku as much as they are in the Yakuza, that means that they are hugely over represented. One wonders about the motivations of Zainichi Koreans joining these groups. Read the rest of the post yourself. The Zanichi Korean presence in Yakuza and Uyoku (actually, it is common knowledge that these two are somehow connected) is well known in Japan- when you see TV or newspaper reports of Yakuza or Uyoku members being arrested by the police, you can’t go on without noticing the strong Zainichi Korean factor. Talking about the dark side of Zainichis was much a taboo in Japan, as you should be able to imagine how scary it would be to openly criticize them. Well it’s natural that there would be a strong Zainichi Korean presence in the Yakuza. Aren’t Zainichi Koreans considered to be some of the lowest of the low in Japanese society? (At least traditionally?) And hasn’t the Yakuza traditionally been an outlet for society’s outcasts to find some sort of acceptance among a portion of the community, no matter how dark it is? It’s totally not surprising to see Zainichi Koreans involved in these groups. Not so much from a Japanese political standpoint but from a Korean one too. It was Hisayuki Machii who was suspected of kidnapping KDJ in the 1970s when he came to Japan. Also, it seems the Zainichi Yakuza have financially benefited from their criminal activities in Japan’s underground, too. Where they wouldn’t stand a chance of obtaining any sort of power or money in mainstream Japanese society, they seem to have found their niche within Japanese organized crime. During annexation, Korean citizens in Japan had right to vote as well as right to hold office. There were several ethnic-Korean members in the pre-war national parliament. Has any Korean in Japan ever been removed from a public bus or told to move to the back of the bus? I know of no equivalent of Rosa Parks in Japan. Being granted basic human rights does not mean a minority is not treated poorly by mainstream society. Indeed, many of Yakuza members (Japanese or Korean), have traditionally become involved in organized crime because for whatever reasons, they were/are shunned by the majority. There is a decent book out there you should read if you want to learn more about the Yakuza and even about Zainichi involvment. There are other references throughout the book as well talking about who joined the Yakuza and for what reasons. The book states lots of statistics regarding Korean involvement in the yakuza. I think it’s fair to say that ethnic Koreans have been treated poorly by Japanese society and that one of the few communities that has been accepting of them, is the underground criminal community. I don’t really see Koreans being treated poorly by the Japanese society compared to other ethnic minorities in Japan. In my impression, many Koreans take too much pride in their ethnicity and don’t seem to make every effort to conform to social manners and customs in other countries. And even if they are treated unfairly, they shouldn’t join criminal groups that cause lots of troubles. It only gives other Koreans a bad name. Mika—I wasn’t signling out Koreans vs other minorities. I was simply providing evidence against your claim that they WERE NOT being treated poorly in society and saying, as I did in my original statement, that it is no surprise that they have found a sense of belonging in the Japanese underworld as they have traditionally not found such acceptance in mainstream society. That’s all I was saying. And yes, Koreans aren’t the only minorities treated poorly in Japan. In fact, just last year the UN blasted Japan for its poor treatment of all minorities. Just to clarify, I wasn’t making any excuses for them. Criminals are criminals and not just the Korean yakuza but the Japanese majority involved in organized crime are pretty much scum too. Yes I would agree, it gives SOME Zainichi a bad name but not all. You seem to forget though that anyone involved in the yakuza—INCLUDING JAPANESE people, not just Koreans, get a bad name for their involvement. That report is seriously flawed. Even anti-Japanese blogger Plunge didnt like the report. Thanks for that link Matt…I hadn’t seen it before. Anyway, flawed or not, it is naive to believe discrimination in Japan does not exist and that it is/was not a factor driving some Zainichi to crime. I say “was” and “traditionally” in all my posts because I am unfamiliar with how much things have or have improved since the Kaplan book’s expanded edition came out a few years ago and since the prime days of the Zainichi yakuza (which seem to be over). I have been told that affirmative action policies have been put in place in Japan, especially for the Okinawans and Ainu and that change is happening but that it is going painfully slowly, especially outside of Tokyo. If so, it’s wonderful things are getting better but it does not weaken my argument that discrimination in Japan influenced Zainichi participation in the underworld. Remember, I’m not excusing them. I’m simply saying I’m not surprised at the presence of Zainichi in the yakuza based on how they have been treated in Japanese mainstream society in the past. Even though I think I’ve offered enough written evidence, I could probably dig up more if no one is satisfied with what I have offered so far. Then what on earth do you want to say, jodi? Zanichi had the same civil rights with Japanese under Japan’s rule.As Mika said,Korean citizens in Japan had right to vote as well as right to hold office:some earned a lot, much more that average Japanese:some became a star whom Japanese admired.I fogot when African-American got full civil rights but it was not long time ago, wasn’t it. On the other hand, from the fact that there still remains descriminative words for Koreans, I guess there was some sort of descriminative attitude toward Koreans under Japanse rule—I am not sure exactly how it was like,but i guess some Japanese used racial slur to some Korean. But it is also fact that there were some Koreans and some Japanese who were doing well as friends. Younger Koreans were born in Japan,they speak Japanese perfectly ,probably a few can speak Koreans and most of them go under Japanese name.In daily life, Japanese cannot descriminate Korean because literally Japanese can not tell Koreans from Japanese. By the way, in my neibhorhood, Zainihi koreans are living in a big house while I live in a small room at the apartment.They go by Japanese name but they told me they were Koreans;we are doing well. It is true that some Zainichi are descriminated in the some governmental job applications, but that is because they do not choose to naturalize to Japan,though they can if they want and despite the fact that a lot of Japanese suggest Koreans to naturalize—Some koreans says they are proud of being korean so they do not naturalize. A few Korean are begining to realize that Koreans can be proud of being ethnic Korean with Japanese citizenship–I think they are right. I am not saying there is no racial descrimination in Japan. And it might depend on where you live,and in western region, it is said burakumins are descriminated. (I am not sure how,though). When Jodi asked “are Zainichi Koreans considered to be some of the lowest of the low in Japanese society? , I was at a loss how to answer.I did not understand in what sense “the lowest of the low” was used in this context. I was at loss how to respond.I did not understand in what sense “poorly treated” is used. Besides, the sentense alludes that because Koreans were poorly treated, they had joined the gangs. I am not sure of exactly how Koreans were treated in the past under Japanese rule or just after the war, but now as I said, we can not tell zahichi Koreans from Japanese. So I wonder if it is because they are treated badly as koreans that they became yakuza.I’d rather think that they became Yakuza for the similar reasons that other Japananese became Yakuza.The motivation might varies,but I guess the racial descrimination from Japanese plays a minor role. In case of zainichi uyoku,rightists, the story seems differnt. But I have heard others say because they want to assimilate to Japan completely, they become the extreme consevative—you know the consevative try to preserve the tradition and probably they mistakenly think what they are doing represent Japanese tradition. I might be mistaken;for,the minorities have their own perspecive that I as one of the majority do not notice. So if zainich Koreans are reading this, please correct me. I might be wrong because the minorities have their own perspective that the majoritiy does not notice. Just for the record, after World War II Koreans resident in Japan had these rights removed, as a prelude to the Japanese government unilatrally revoking their citizenship when Japan regained sovereignty in 1952. I think much of the sense of being “poorly treated” comes from the fact that zainichis who are born in Japan and know no other country are still classified as foreigners and made to carry alien registration cards. While I agree with much of ponta’s comments on decreased dsicrimination assimilation of zainichi Koreans into Japanese society (borne out by research I did for a paper), the yakuza has traditionally been a haven for those “outcast” from normal Japanese society. (I’m not justifying those who join the yakuza, just saying what it may have offered them beyond ill-gotten gains.) Even so, it is very interesting to think about the motives of those joining Japanese ultra-nationalist groups. I think much of the sense of being “poorly treated” comes from the fact that zainichis who are born in Japan and know no other country are still classified as foreigners and made to carry alien registration cards. I’m reminded of an ‘incident’ around this years testing season. A Zainichi complained of racial discrimination at Kanagawa University when he was asked to present his alien registration card before taking the test. His justification was that no Japanese was asked to show their alien card, therefore it’s discrimination. Well, a Japanese person doesn’t have an alien card, but I do, and I was asked to show the same card when I took my university entrance tests this year as well. The alien card is the legal form of ID issued to aliens in Japan while there are other forms of ID available to Japanese citizens in Japan. The Japanese students are required to show their own ID as well. Many of these are third generation zainichi who are in Japan because they were brought there against their will during WW11. So who has Japan got to blame for this problem? Many of these are third generation zainichi who are in Japan because they were NOT brought there against their will during WW11. So who has Japan got to blame for this problem? Yes that’s true, but no one is forcing people to stay, and no one is denying one the ability to take citizenship either. Just by saying Japan was bad in WW2 doesn’t mean everything is Japan’s fault. WW2 is over, and it’s control of the world today is as well. it is a myth that the first generation of Zainichi were forcedly moblized to Japan;they came Japan volountarily looking for jobs. That is the myth the son on Matt’s thread is debunking. 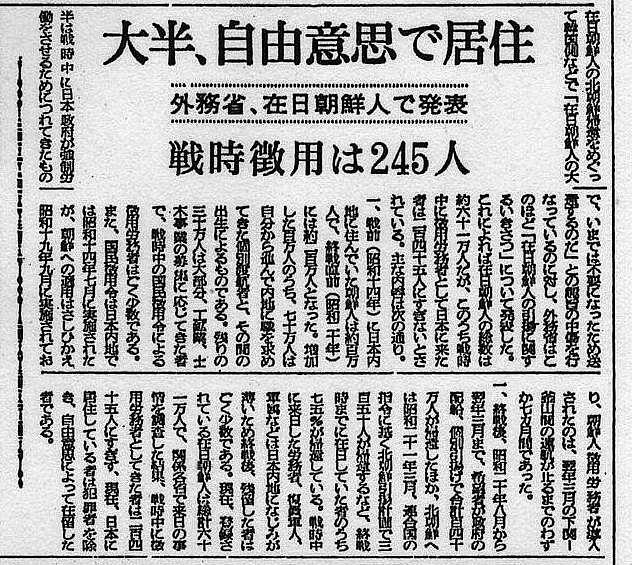 Besides, according to Asahi newspaper, only 245 korean people were forcedly mobilized to Japan as a worker. darintenb: I don’t think most zainichis choose to keep their Korean identity for “political reasons”. Here’s what I think: as foreign residents, they are not allowed to recieve social security and other benefits, although with the “Pensions Case” lawsuit that may have changed. This is in part why residents’ association such as Mindan and Chongryun are so influential within the community – they offer support when the government won’t, and strengthen people’s self-identification as “Korean”. However, I heard from a zainichi Korean student I interviewed that after they leave the Korean schools, many students find it easier to “be” Japanese, and leave their Korean identity behind. I only have my own limited research to go on in this debate, and so don’t want to draw too many conclusions. But the above is my basic theory. This is the part I find hard to understand when talking about Zainich. It might be true as a foreigner they are not allowed to receive benifits like some of social security that is approved for Japanese citizens, and yet,most of them do not choose to get Japanese citizenship. It might be troublesome but it is not so difficult to get one. (for your referenceWhy do they not choose to natualize to Japanese? If they want to get full social rights as much as japanese, I think it is not unreasonable for them to get Japanese citizenship. Some speculate that zainichi have other benifits that Japanese and temporary residences can not receive. Others say that their pride in being Korean is so unique that even Japanese citizenship hurts their pride. Still others even speculate that some of zainichi are spies. (it is true that some of them are congressman of North Korea, though). But I have not read any clear theory about it. (By the way my comment above needs correction. but I think it is very misreading→it is very misleading. Ponta! I thought you knew that social security is appicable to all residents in Japan, regardless of his/her nationality! So Zainichis are of course protected FULLY under the Japanese social security system! In fact, the Zainichi are entitled to almost all human rights in Japan except for the right to vote. Zainichis will not even be deported for commiting serious crimes like murder or armed robbery- they will only be deported if they are concivted for crimes like starting civil wars, inviting foreign militaries to invade Japan or start wars with other countries. This Japan bashing has gone too far! Ponta, dont worry about your English. I admire your ability and fortitude in debating in a second language. I used to debate in Japanese and Korean but I gave up because debating in a second or third language is so tiring. Thats right. Kenkanryu and Kenkanryu 2 has the same information about Zainichi rights. Thanks.Wow,I didn’t know that. I thought some social security were not applicable to Zainich,because though it is the obligation of the State,stipulated by the article 25 of Japanese consitution, to promote social security for its nationals, but it is not obligation to do so for the foreigners;it is obligation of the State that the foreigners belong to.Well Japan is generous.isn’t she? And Japanese government gives a subsidy to Korean schools which admire North Korea and which brainwash its students to believe N Korea is a paradice ?—well,Japan is stupid, isn’t she? Matt—Thanks.I admire your work here. BTW, thanks for the info. I will read it as fast as my limited Japanese permits. I think he is referring to the large amount of misinformation about the policies of the Japanese government towards Korean residents in Japan. “Japan-Korean friendship” is the right order without exception unless those letters are written by Korean sided people. Ha. Taken out of context, this is a very funny statement. Actually, I found it funny even in the original context. The right order without exception… hehehe. I haven’t had internet connection for a long while now. Will probably have it back next week sometime. Did I miss anything important? Of course, if anyone reponds, I won’t be able to read the response. The Yakuza-Korean link is interesting because I remember a year or two back (this was in Japan) reading in the Mainichi Shimbun a statistics list of ethnic groups and the crime rates. I believe this had to do with complaints of immigrants and crime. Anyway, this list also compensated somehow for the difference of smaller populations, smaller crime rate and the percentage ratio of the crimes. The crime rate by Koreans were surprisingly very low; lower than even the Japanese which is no small feat. Surprising because they do seem to express outrage the most and from my experience more…’wild’ I guess is the word, than even the Chinese who were rated higher on the list than Japanese. Explanations could be that the Yakuza fibbed the numbers which is quite possible. I don’t think they would be high ranking, but perhaps they are in the services level such as their accountants or whatnot. That or they changed their names to Japanese ones and started causing crimes. This sort of makes sense because the ones who were adamant on keeping their heritage name despite the extra hassle would probably also tend to raise their kids with more care and manners. Also, the whole east asian zainichi issue, to be simple and not toss in the various consitutions/laws, is mostly a hassle which can mostly be almost totally removed if you change your family name to one that is closer in the Japanese family name database. Well, unless your trying to get a government job which in which case the barriers are much higher, but to be fair most other governments go through similar screenings and with the fear of North Korea/China looming about it is somewhat understandable. Now, if you actually look racially different, that’s another story. But yeah, it’s not that bad, just some bad information running around and some misunderstandings about different cultures. it is true that many zainichi koreans are involved in illegal activities and groups… and many of them are currently leaders of some smaller groups. I don’t think the main reason is because of their poor living conditions. I think its the role models like Rikidozan, Mas Oyama, etc who were involved with Yakuza etc. Roppongi is basically made into what it is today by the Yakuza which Rikidozan was involved in. I think that’s why there are so many zainichi in these groups. This amazingly gritty saga of the formidable rise and demise of Kin Shunpei, a Korean immigrant to Osaka, Japan in the 1920’s depicts not only the struggles and victories of the early Korean immigrant communities within Japan but also the almost unwitting emergence of a highly entrenched (Korean-immigrant-based) Yakuza presence which (it is said) exists to this day.